Have you ever wished that you lived in the time of knights, damsels in distress and Queen Elizabeth? 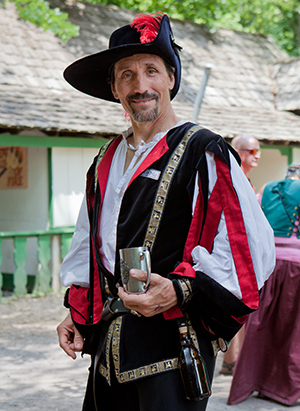 You can try it out for a weekend right here in the Finger Lakes when you attend the Sterling Renaissance Festival. Last week, I ran into a friend who has escaped into the Renaissance Festival for over 10 years. She is a “Playtron”, one of the folks who dress up to attend the fair and interact with the professional actors on a more personal, interactive level. She and her husband have historic garb, play instruments and actually camp nearby so they can be there every day, every weekend for the run of the jubilee. You and I will probably attend as a plain old patrons. No costumes and perhaps a bit scared about what we may encounter. But come prepared for an inspirational day. The entire event is outdoors and happens rain or shine. My friend advises that you wear comfortable shoes; rest frequently; keep hydrated; and be ready see what life was like in the 1500’s. If you don’t have your own bodice or doublet, you can rent a costume for the day. There will be street scenes; sword swallowers; acrobats; Leonard da Vinci’s brother, Bob; hypnotists; rope walkers; and jousting. This along with all sorts of music: fiddles, flutes, madrigals, Celtic tunes, bodhran, whistles and rowdy pub songs. There are rides for kids and The Bawdy Basket for more adult entertainment. Catch a Shakespearean play, the dunking booth and a sword fight. Wondering about food? Again, my friend advises that you go hungry. She likes the spinach spanakopita, but says the Fish & Chips and the Turkey Legs are quite popular; too. You can snack on a Mile High Slice of Cake; Sundaes; cheese curds; or Strawberry Short cake; and sip a Wine Slushies. Or nibble a Veggie Burgers and Chef Salad. At the end of the day beg inning about 6 pm, the entire cast congregates for The Pub Sing. Music, jokes and more to end a perfect day of play. And on the last day of the season, you will want to see The Rose Parade during which, 2 by 2, guests present The Queen with a rose. There is even more singing and joking and whatever come along! On Saturdays and Sundays from July 5 – August 17, you can wander all day from 10 am – 7 pm along the wooded paths and find something new and exciting at the turn of the path. You can even get married in the Wedding Chapel, an authentic thatched roof cottage. Or raise your pinky during The Queen’s Tea when you visit with Royalty and her Ladies of the Court as they demonstrate proper courtly manners over afternoon tea and cookies. Their opening weekend is a Family Weekend, with a ticket special of buy one regular priced adult ticket and get one adult ticket half price OR one free child&apos;s ticket! Additionally there are more themed weekends like “Wine, Chocolate and Romance Rendezvous”, “Ale Fest”, “Pirate Invasion”, “Highland Fling” and The Grande Finale Weekend over August 16 and 17. I cannot quite decide which weekend to go to the Renaissance Festival, but I know I will be there will bells on! I will say hello to The Queen for you. Susan Marteney teaches Community Education classes at CCC and is a co-owner of Tuxill House, a European-style guest house in Auburn, an avid gardener and a community activist.